PS – The photos are different too! One of the things Steph and I have always had in common is our mutual appreciation of mountains. Not just any mountains though, they need to be lonely freestanding introverted mountains, preferably symmetrical, preferably snowcapped. We have a bunch of them on the west coast — Robson, Baker, Rainier, Hood, Shasta (sort of) and St Helen (sort of), just off the top of my head. We’re pretty lucky to have so many nearby — or unlucky if Rainier ever erupts. Before Steph and I started dating, we were snowboarding buddies, so mountains have an extra special place in my heart. My friend would always drive us up the mountains before we would go snowboarding in his Jeep he got important from Jeep Montreal. Our love of mountains combined with all time we spend in Japan makes it no surprise that we both came to be pretty crazily obsessed with Mt. Fuji. One year we spent days in Tokyo tracking down very specific, very overpriced Fuji-san shaped beer glasses and dish sponges. We’ve never opened the wooden boxes that the glasses came in, so we have never seen them or know if they survived the flight home, but we both love our Fuji-shaped Schrödinger glasses. 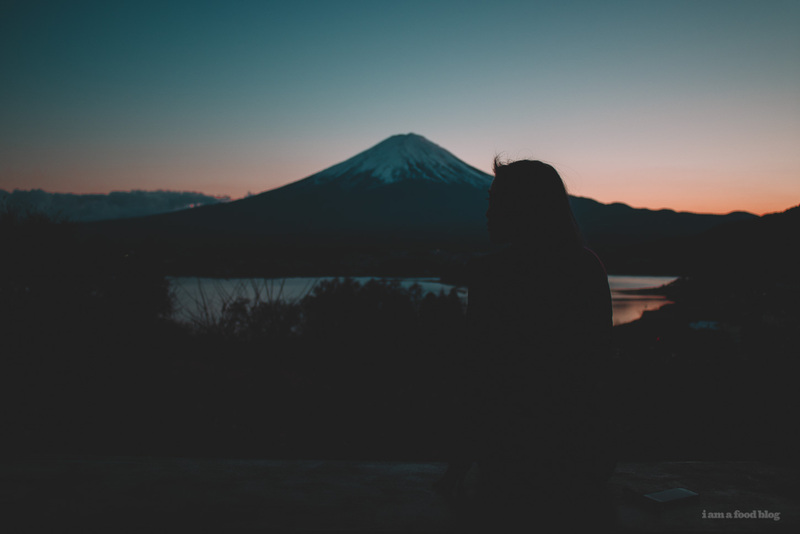 We’d always look at Fuji-san from rooftops and random hills in Tokyo, or on the train from afar, but we never really found the time or inclination to go, even though it’s so close to Tokyo that you could do it as a day trip. 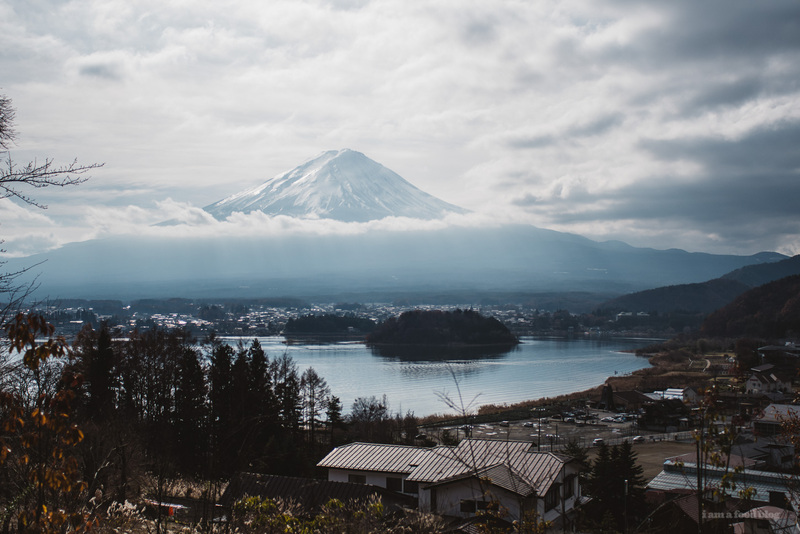 So this year, while planning our annual semi-traditional trip to Japan, we told ourselves this was the year we’d finally make it to Fuji-san and make it out mission to start getting outdoors in Japan. Appreciating the view and making memories is what it’s all about. When we plan these trips we split the duties: I arrange the flights, Steph finds the hotels. 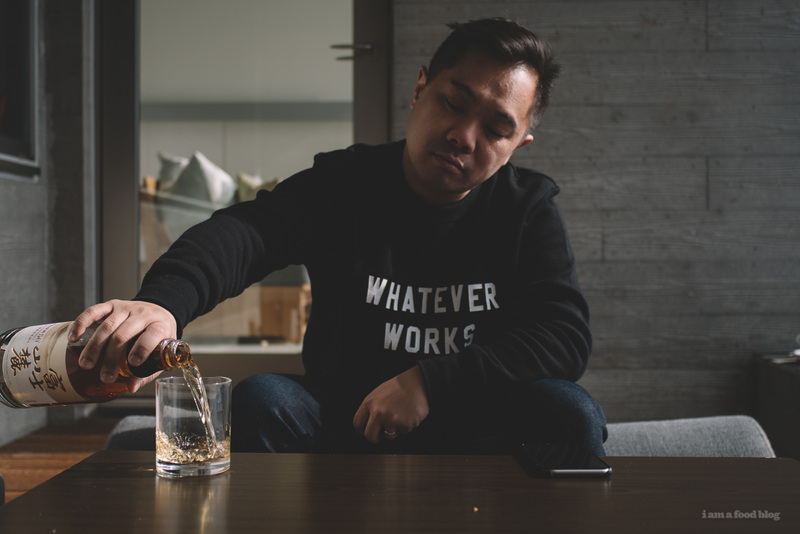 It works out well most of the time, because it plays to our strengths and interests (for me, points and upgrades, for her, cozy spaces), but it can sometimes backfire. One of the things I’ve always loved about Steph is how easily excitable she is. When she gets excited about something, she just goes nuts and really doesn’t think. 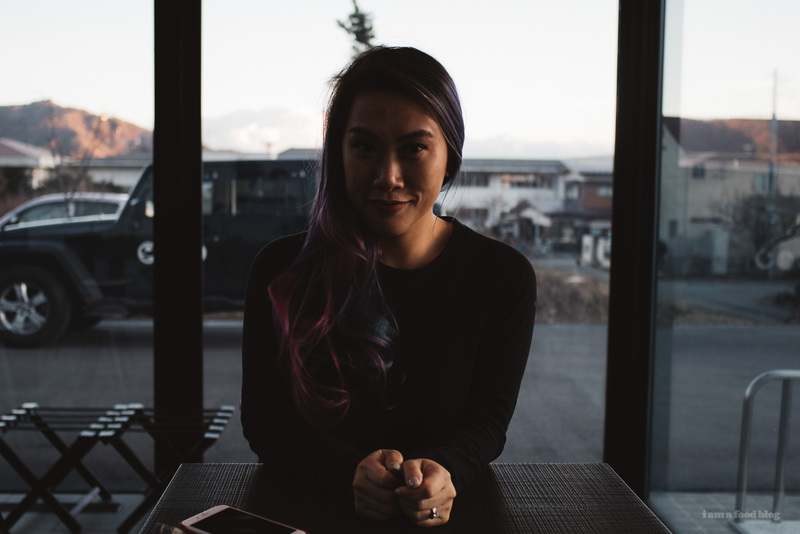 This can be both a blessing, because it’s super funny (and cute) to watch, and a curse, as when she panic-booked a non refundable, credit card-guaranteed reservation at Fuji-san for the wrong dates – actually, before we even had dates at all. In her defence, she claimed it was the only room left for months. Outside of the panic-booking tendencies, I utterly trust Steph’s taste when it comes to these things and her ability to find cozy spaces no matter where we are in the world. Because of this, I never actually look too closely at what she books, and consequently I was blown away when we finally made it out. The hotel she chose was incredible, and I was reminded again of why I trust her taste in hotels. 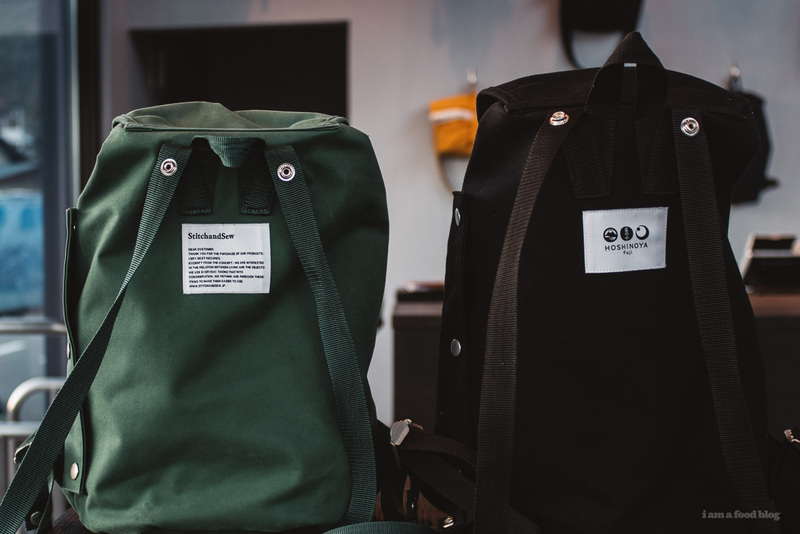 This year, because we went big on the camping front, we also came to fall in love with Japanese camp style. When camping in North America, the idea (for us, at least) is to get away from the luxuries and pressures of modern life and really get back to basics; cooking food over a fire we’ve built, living off only what we could bring in, sleeping under the open sky. In the camping world, there’s even something of a hierarchy about camping: the tent people look down on the RV people, the backpackers look down on everyone. At the end of the day though, it’s about going as primitive as you’re personally willing to go. We stayed in an RV and the RV Battery died, so it wasn’t a great experience. 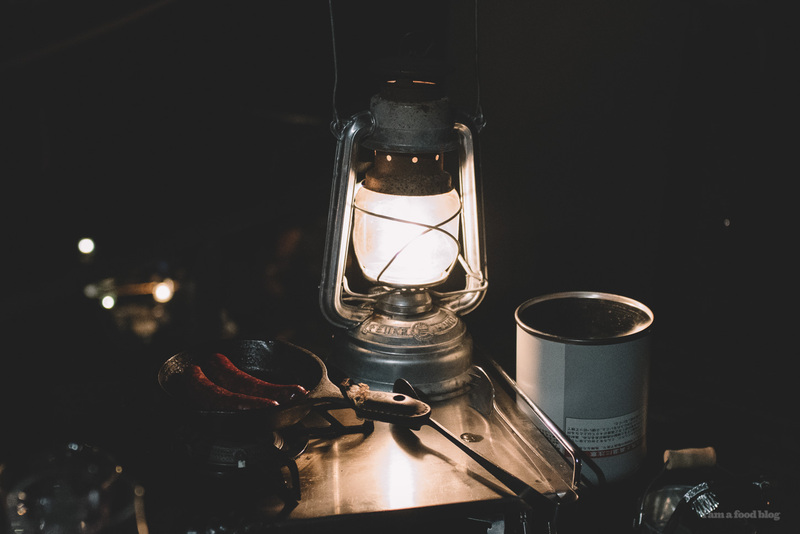 Japanese camping, on the other hand, is where you take the best parts of your home with you and hang out with all your friends in one big social gathering. The typical Japanese campsite (from what I’ve seen on Instagram, so take that with a grain of salt) seems to be composed of a sleeping tent, a living tent, a cooking tent, 5-6 coolers worth of food, and at least three methods of cooking, including sometimes what seems to look like a full fledged pizza oven, all set up out on an immaculate open field with dozens of friends with similar setups around you. I’ve always wanted to take Steph camping in Japan, but the sheer cost and difficulty of it – thousands of dollars worth of equipment, renting an SUV big enough to carry it all, not knowing anyone at the campsites – made it seem like a pipe dream that could never happen. At our hotel however, I was in for a surprise: this wasn’t just an ordinary hotel with a nice view of Mt. Fuji, it was a glamping themed resort, and it turned out about as close as I can imagine to us camping Japanese style, in Japan, for real. The staff had custom jeep wranglers to get us and our luggage up the hill (Steph thinks they’re Range Rovers and I didn’t want to spoil the fun). Both the the jeeps – and later, our cabin – reminded me of our trip to Iceland. Ever since we and our little rental mazda were rescued from an impassible mountain pass by an Icelandic super jeep, I’ve lusted after one and have been hinting to Steph that we should go to Iceland in the summer with a rented super jeep. Our cabin, once we got in, reminded me of a cosier, more modern, and much warmer version of an airbnb we booked in the north of Iceland that was one of the best parts of our trip. 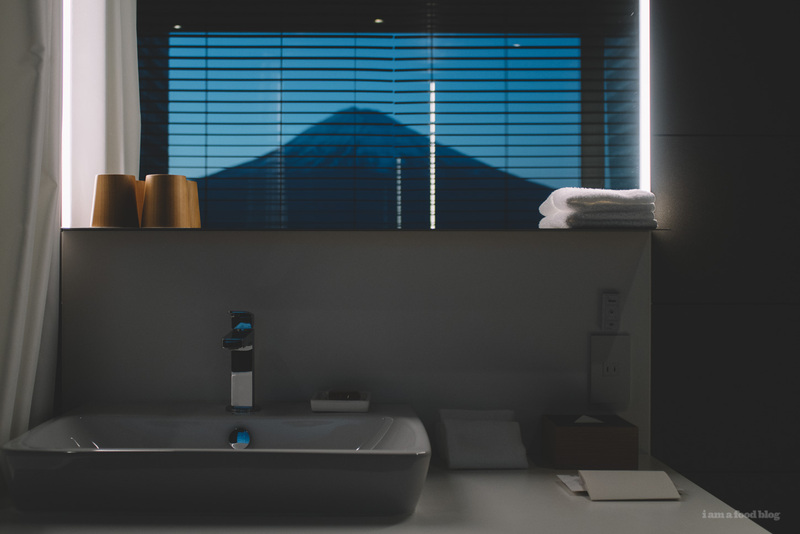 Where the Icelandic version was all grey and muted (and freezing cold), the Japanese version was all white with soft lighting and possibly the world’s greatest bathroom, with a full panoramic view of Mt Fuji. We filled our time with camp activities. We both chopped wood for the very first time. We smoked our own dinner, Japanese style, using wood from Hakushu (one of my favorite Japanese Whisky distilleries). 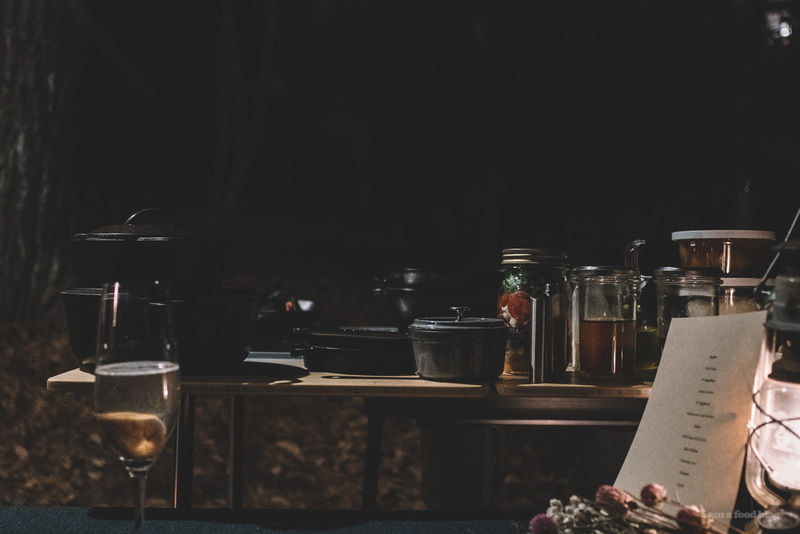 We roasted marshmallows over a firepit, and Steph even got to cook part of a dinner, Japanese camp style with five dutch ovens over snow peak burners (I declined and filmed it instead). 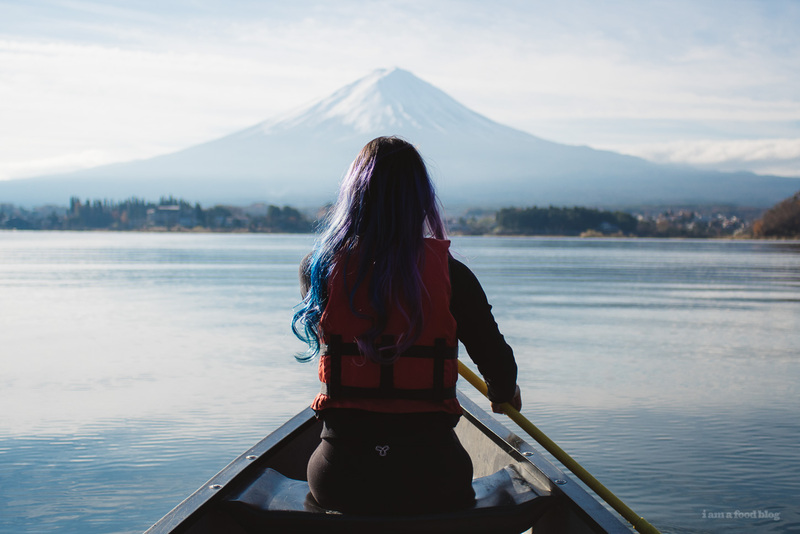 We went canoeing on the lake with Fuji-san in the background. It was a bomb-tastic time, but the best part of camping isn’t the activities you do, it’s the quiet times in between when you can sit with your camp buddies enjoying the silence with a somewhat cold beer (or if you’re me, whisky) in hand. 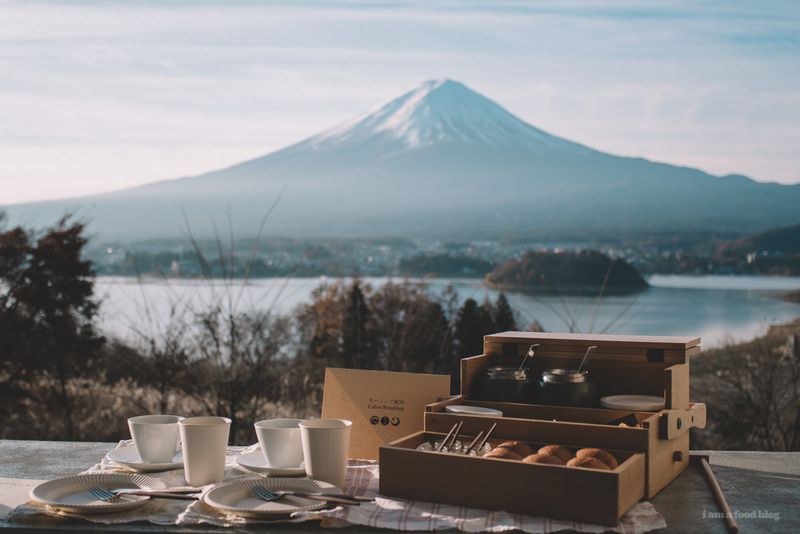 Here, we got to go one better and spent our downtime sitting out on the deck underneath the warmth of the kotatsu in the cold crisp late autumn air and appreciated some of the thirty-six views of Mt. Fuji. We had a personal tiny outdoor fire on the deck and watched shooting stars as the sunset turned into late night. I fell in love with the cabin and the view, watching the sunsets and sunrises with whisky in hand and my wife by my side. Steph fell in love with the kotatsu. She’s always known that I wanted to take her camping in Japan but dreaded the thought of getting so much equipment across the Pacific ocean. 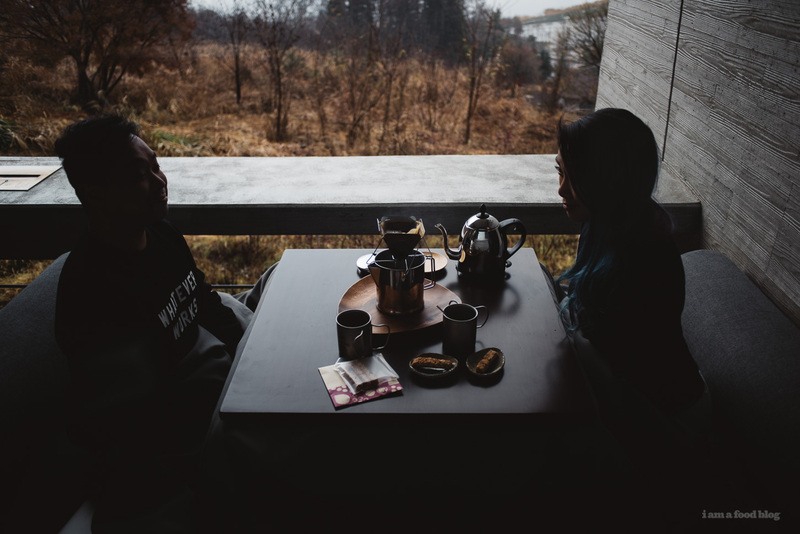 The last morning we were there, as we were having ‘camp’ pourover coffee and watching the sunrise again under the warmth of the cozy kotatsu, she asked me if instead of bringing a ton of camp equipment across the ocean, could we bring the kotatsu home instead? I found myself promising that yes, somehow we’d figure out a way to get this giant coffee table and blanket setup on an airplane on the way home. It took some thinking, but I have a plan to do just that. Mike and I went to Japan four times before we finally made it to Mount Fuji, or Fuji-san, as locals honorifically call it. I have long been obsessed with his perfectly conical shape, flat topped snow cap, and bucolic blues, which is why it’s funny that it took us so long to visit. Most people, when you tell them that you’ve been to Japan, ask, oh, have you been to Mount Fuji? And yes, it’s true, Fuji-san is short 2 hours and change bus ride from Tokyo. Even my parents have been to see Mount Fuji, and they’ve only been in Japan once. It’s not like Mike and I haven’t admired Fuji-san from a distance – you can clearly see him from Tokyo on a bright blue day, or from the train as you’re traveling to Osaka for takoyaki. 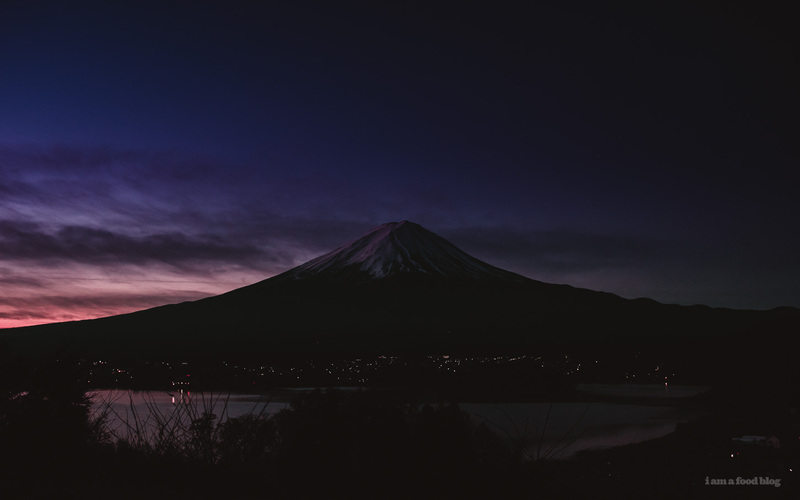 And once, we even went rooftop hopping to catch a glimpse of Diamond-Fuji: a somewhat rare-ish winter occurrence of the sun rising or setting right on the peak, causing Fuji-san to shine bright like a diamond. But, seeing Fuji-san from a distance wasn’t going to be enough for us this time around. Four missed opportunities behind us, we decided to go all out and do Mount Fuji the right way. When you do a deep dive on Google looking for where to stay near Fuji-san, you get a lot of results. I mean, you can see him from practically anywhere, he is 12,389 feet tall, after all. 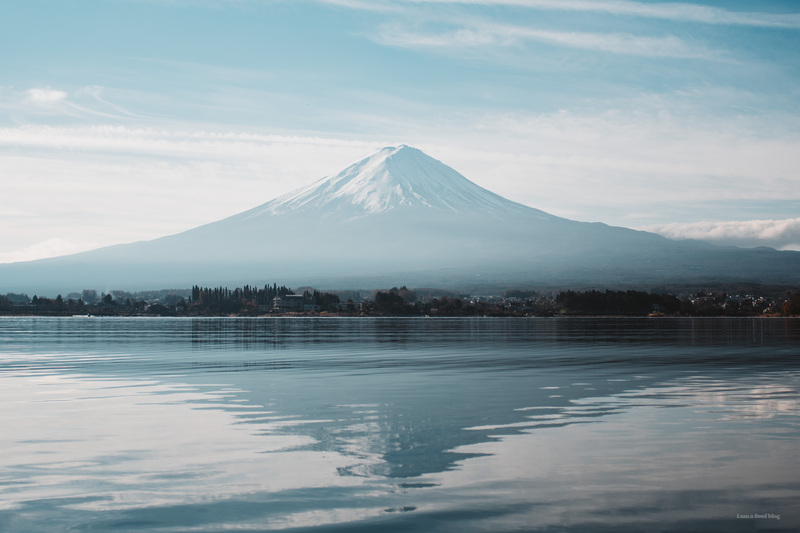 But, the results consistently said, if you’re looking to get upclose and personal, you should check out the Fuji Five Lakes district, in the Yamagashi Prefecture. All five of the lakes were made by Fuji himself, back when he exploded. Of the Five, Lake Kawaguchi, or Kawaguchi-ko (the ko means lake in this instance) is the most famous. After loads of Trip Advisor and booking.com reviews, Mike and I (well, really it was me, because I get obsessed) decided on staying at Hoshinoya Fuji. I wanted to stay there so badly that, upon seeing that they were starting to get booked up, booked us some random dates for two un-refundable nights. See, thing is, booking.com usually has this thing where you can book and alter your dates, easily. I guess I was so excited that I didn’t (refused to) see the fine print. To be honest, I have no idea why I didn’t just book through their site – they have the best rates and let you adjust dates. I guess it was just a d’oh moment. And at this point we didn’t even have plane tickets. What can I say, I was excited! If you look at photos of Hoshinoya Fuji, you’ll get excited too! Anyway, Mike emailed them, worked out the dates and we were good to go, which was a huge sigh of relief to me because of the dollar dollar bills involved. Dates booked, we were ready to experience Fuji-san to the max. Fall-Winter is a great time to go to Fuji, if you want to see him without haze. 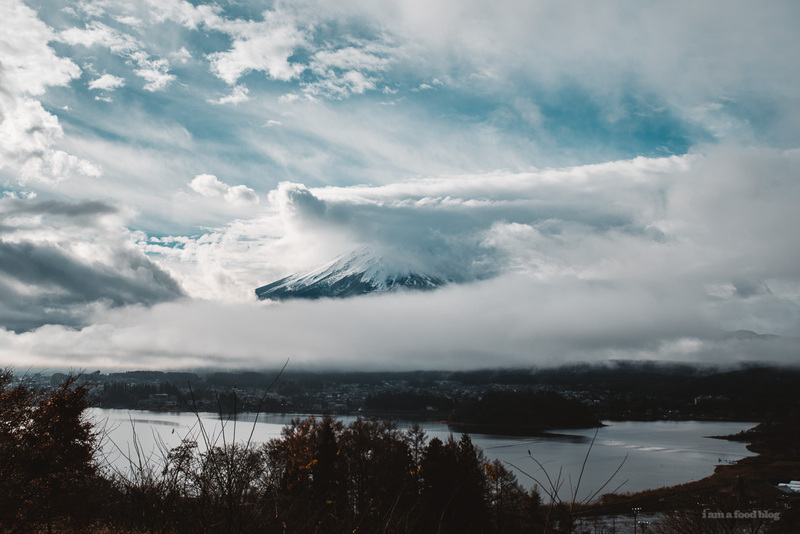 I was a little worried about clouds; when you’re a huge mountain, you tend to attract your own weather, so Fuji-san often hides behind thick cloud cover. And, when we were on the train towards Fuji, he was covered in clouds. But after we boarded the bus and arrived in the tiny town of Fujikawaguchiko, the clouds broke. We were treated to the sun peeking through, and Fuji in all of his majestic glory. 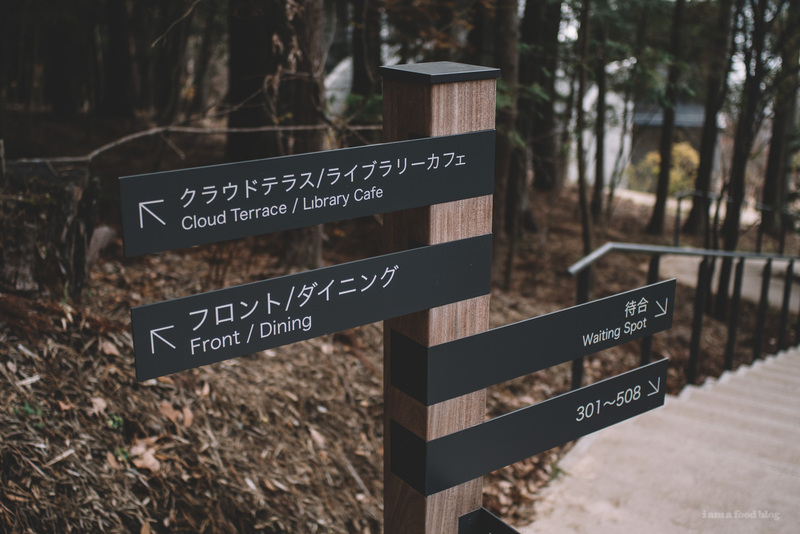 Part of the reason we choose Hoshinoya Fuji, aside from the fact that it’s right next to the base of Fuji-san, is the fact that it’s glamping themed. I’ve talked about my obsession with Japanese camping set ups before, so I figured this would be the best way to experience camp, Japanese style. 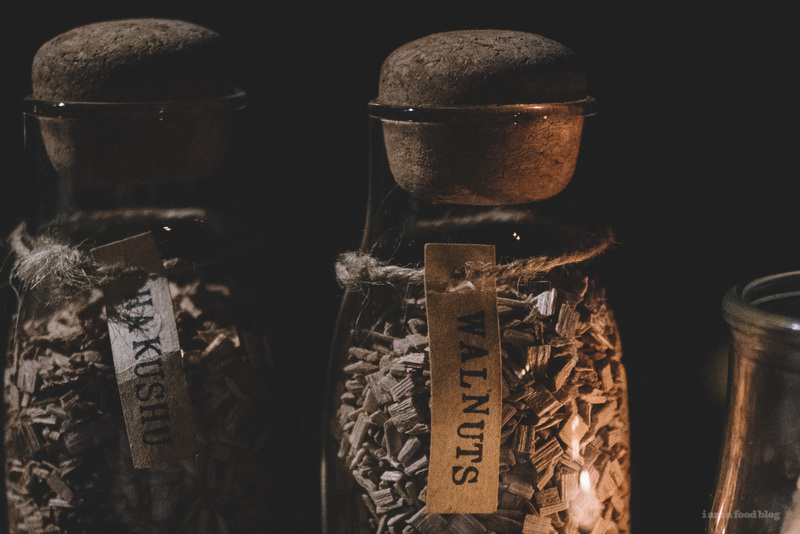 Some camping touches that I absolutely loved: backpacks for you to use while you’re there, filled with hiking supplies; a little balcony fire set up; and camping themed food – some of them even DIY! After we took about ten million photos of Fuji-san at the check-in desk, we hopped into a Range Rover – the whole resort is located on a mountain side, there’s no public transportation that goes up there and taxis can’t make it up the steep driveway, either. The whole time, I was internally squeeing at the cuteness of everything, but I tried to hold it in because I thought the staff would think I was a little crazy. But, when we arrived to our room, I couldn’t help it: I OMG-ed for 5 minutes straight. It was sunset when we got to our room – the sun sets early because it sets behind Fuji, and it was gorgeous beyond belief. 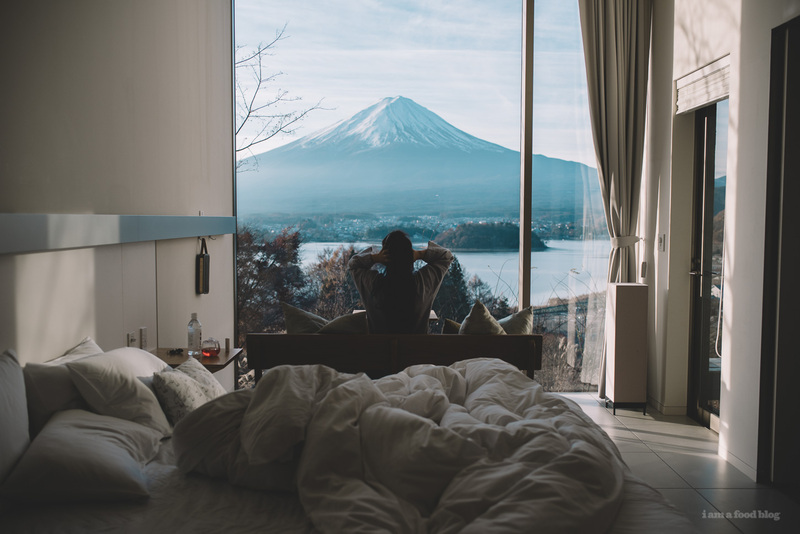 All of the rooms face Fuji-san, with floor to ceiling windows for the best maximum view, at all times. I seriously thought I died and went to Fuji-san heaven. This is going to start to sound very gushy, but I can’t help it, I fell in love. 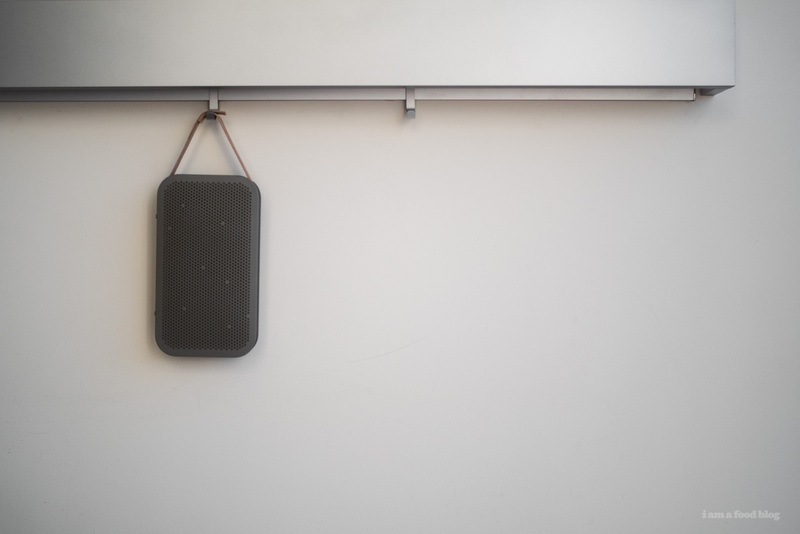 The room had the perfect mix of indoor-outdoor space with touches of Japanese hipster minimalism. 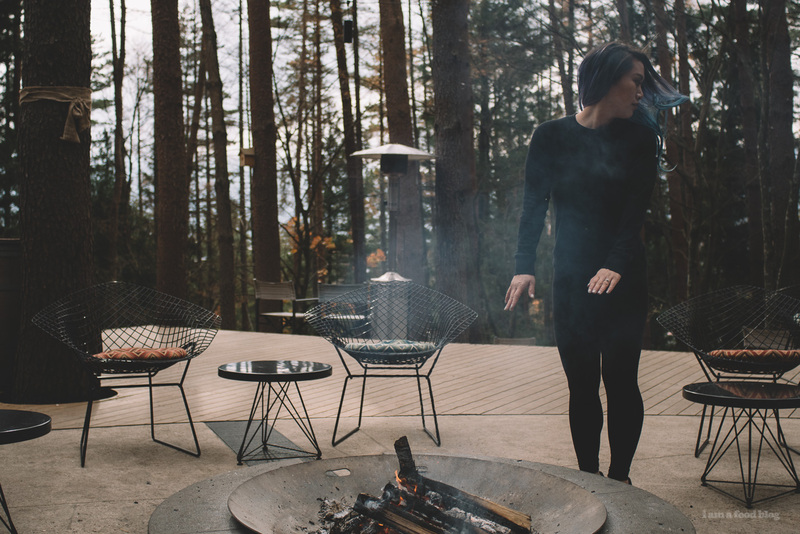 There was an outdoor deck with a poured concrete slab featuring a built-in mini fireplace. You know, to give you the camp vibes. 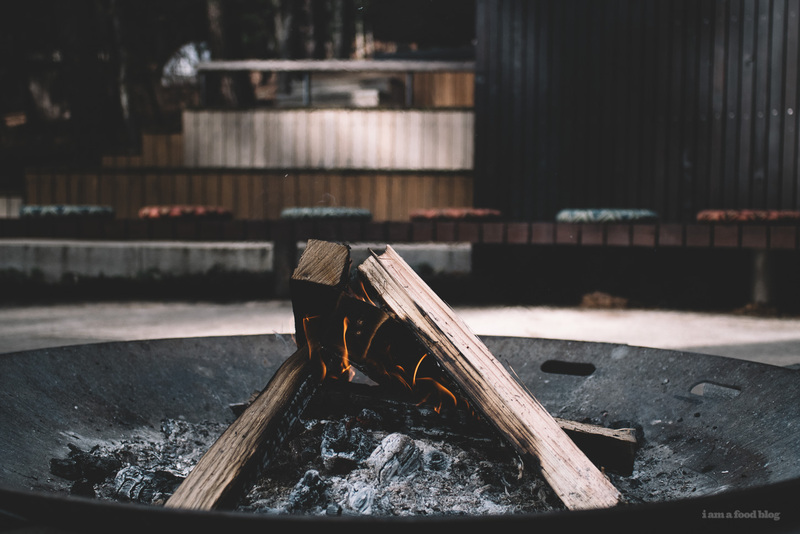 A cheery little fire keeping you warm while you gaze up at the shadow of Fuji in the darkening sky, stars twinkling in and out of focus. The deck was where Mike and I spent most of our time, in the chilly mountain air, drinking pour over coffee (for me) and Japanese whiskey (for him). It was like an outdoor living room, but the best kind of outdoor living room because in the middle, there was a kotatsu, in a sunken couch. 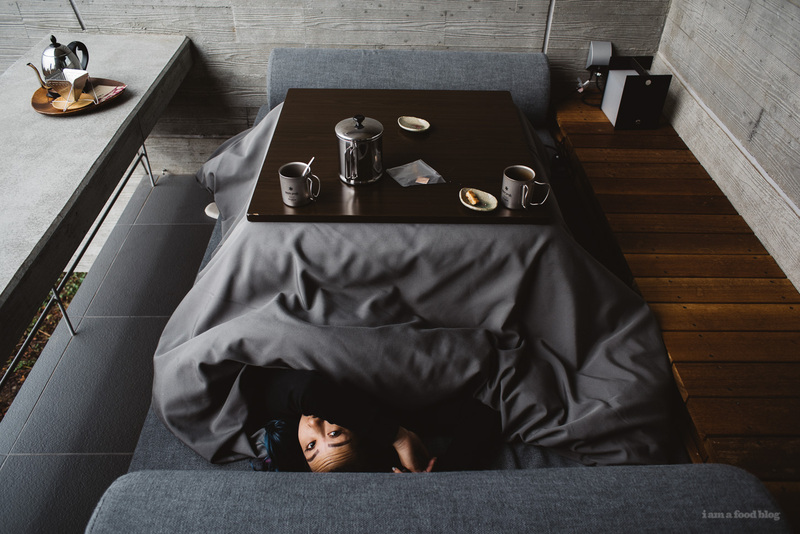 Kotatsu, if you have never experienced one before, is amazing. It’s a table, with a heater on the underside of it. A very heavy blanket goes on top (they call it a futon) and then a tabletop goes on top of that. The idea is: you keep your legs and lower body tucked underneath the cozy heated blanket. You can use the table as a regular table – for snacks, food, working, basically anything you want. I never wanted to leave. 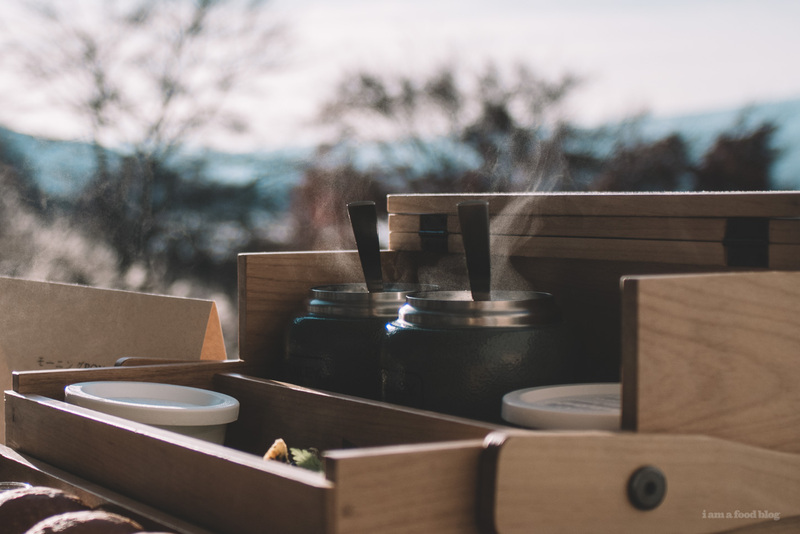 The mix of the cold crisp air and the warmth of the kotatsu was the best of both worlds, especially when we had breakfast out there. The sun rising over Fuji-san, hints of pink on his snow cap, delicious breakfast food, and me by Mike’s side. It gave me the warm fuzzies. The lake was cold and still and we could see our breath puff up in the air. Lucky for us, Fuji-san was visible in all of his glory. And, bonus, the lake was so still and smooth (aside from our paddling) that we could see Sakasa Fuji, or Inverted Fuji. We slowly paddled our way to the tiny, uninhabited island in the centre of the lake for a short hike amidst the leaves, for a different view of Fuji, this one framed by trees. And that’s the thing about visiting Fuji. 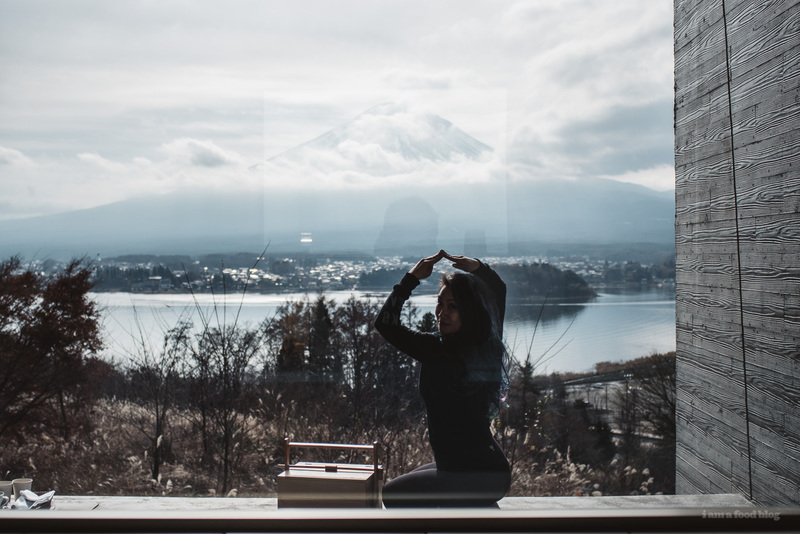 It’s all about being still and contemplating the many views of Fuji. And he does change, from minute to minute. One second he’s there, in his un-hazy glory, and then the next, the clouds are rolling in, a real-life painting with the clouds as brush strokes. The sun strikes through, highlighting the shadows, and you’re dwarfed by the beauty of it all. PS – It really was a magical trip. We saw 2 shooting stars(!) 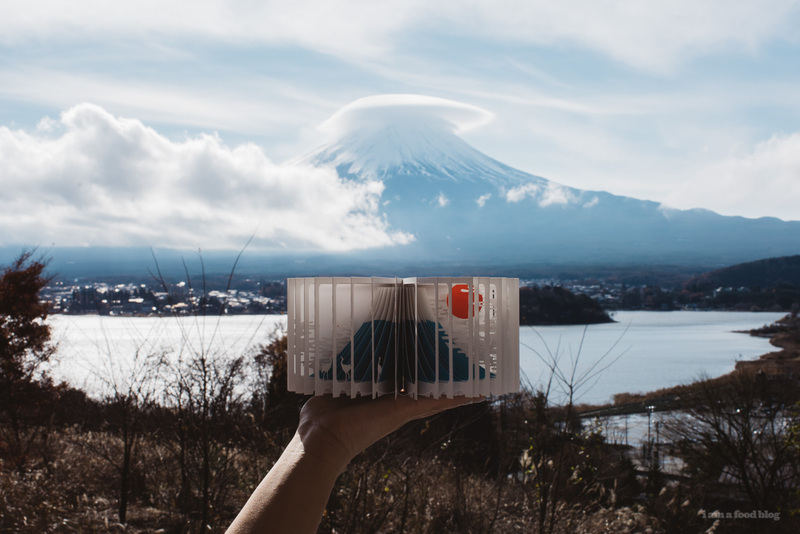 and we got to see Fuji-san’s famed cloud hat, which aside from being cute, is also functional – according to locals, it lets you know that it’s going to rain the next day. PPS – This isn’t sponsored, just wanted to share the love! This is seriously a vacation goal. SO beautiful and cute! Thanks for the inspiration! This looks absolutely amazing. Love the cabin you stayed at and the view is spectacular. All the places you visited look so cool! This is so beautiful, thanks for letting us live vicariously through your adventures! I’ve been to Japan a couple times, but haven’t made it to Fuji-san yet. I’ve just pinned that glamping resort, it looks amazing! Travel goals! magical!!! you’ve both sold me on this resort (which i’m sure wasn’t the intention but i’m still sold). also, holy crap are all these photos beautiful. happy almost new year guys!! Thank you so much for sharing Steph! I’m half-Japanese so still have family in Japan (near the Nagoya area) so have been a dozen times or so but still haven’t made it to Fuji-san. This looks like an amazing place to stay! I’m definitely going to keep it in mind for the next time I go. My boyfriend and I have been starting to think about taking a trip to Japan sometime in the next year or so, and this post just took me from, “hmm, could be pretty cool” to “okay, let’s book NOW”. What a gorgeous place! I think I’d probably spend most of my time under the heated blanket-table (what an amazing invention… I need one! ), but with views like that right from the room… Who actually needs to venture out? I have discovered this place last year but did have not got a chance to visit yet !!! lets hope 2017 will the time !!! very jealous! Somehow I had assumed that camping was the same around the world – clearly not. There seems to be no end to the number of interesting things I keep learning about Japan. I can’t wait to visit. Also – just majestic photos of Mt. 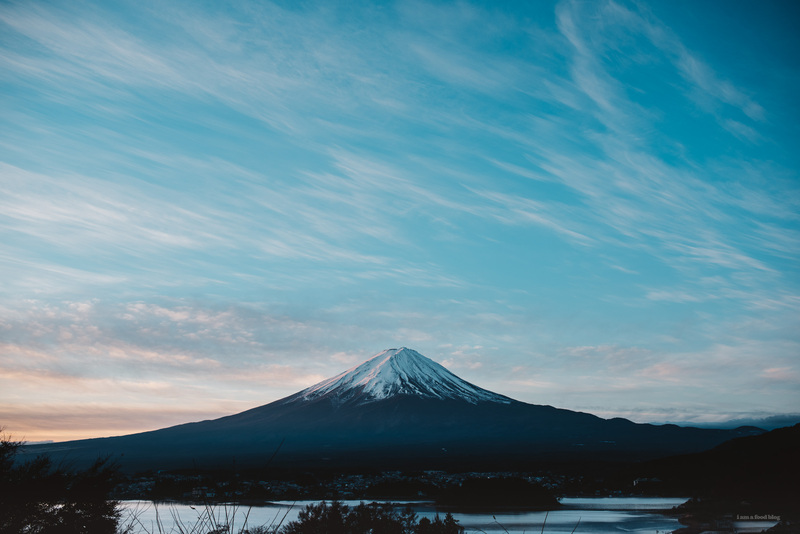 Fuji – how amazing!! Your entry was ADORABLY writen. And now, I realize that I’ve been recreating a kokatsu with my laptop and a blanket for years!! Your photos are AMAZING! I just keep scrolling through – what a stunning place to travel. Thanks for sharing! 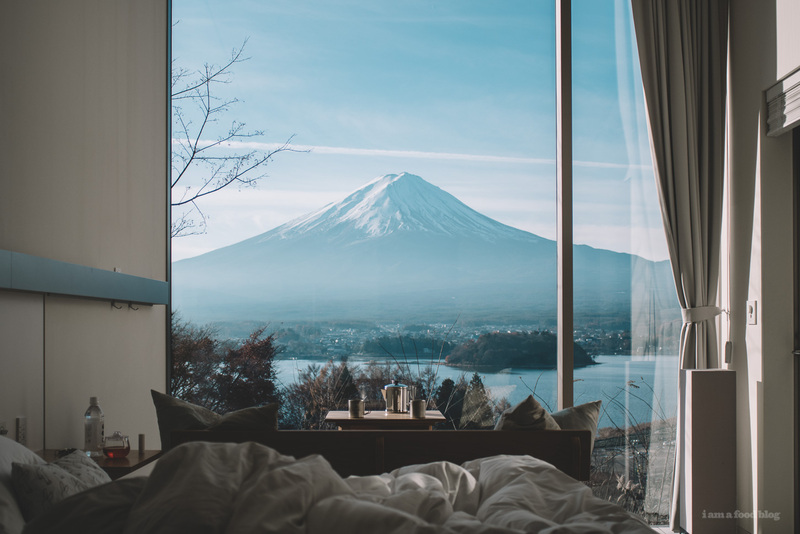 Those pictures make me wanna visit Japan again, specifically the Fuji mountain for the view. Thanks for sharing awesome pictures! How’s the surrounding area with english speakers? I try to visit once a year and am planning on booking a room for this November because of this post, awesome spot! 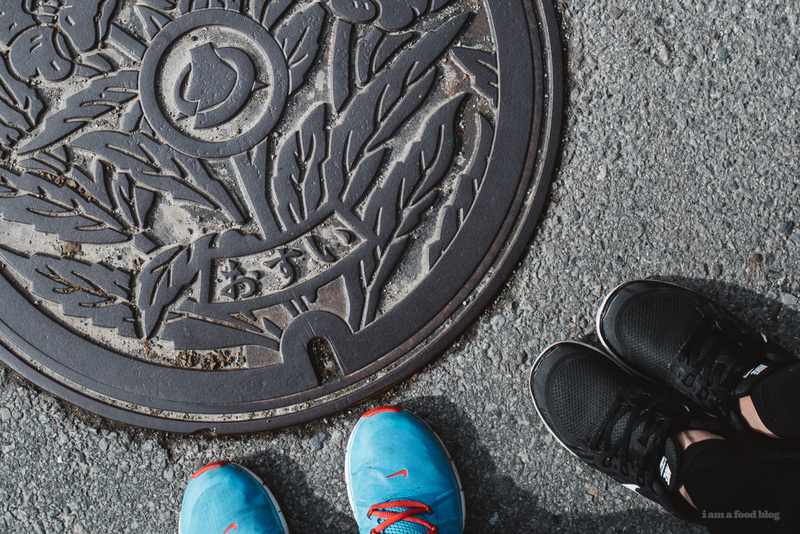 the kawaguchiko area has a lot of tourists so i think you will probably be okay! at hosinoya you’ll be fine, they have pretty good english! Your photos capture the serenity in all its essence. Great Photos! I love Japan! This looks so lovely! 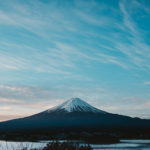 My fiance and I are planning on going to Japan for our honeymoon in June and I am about to book this place (based on this blog post :)). 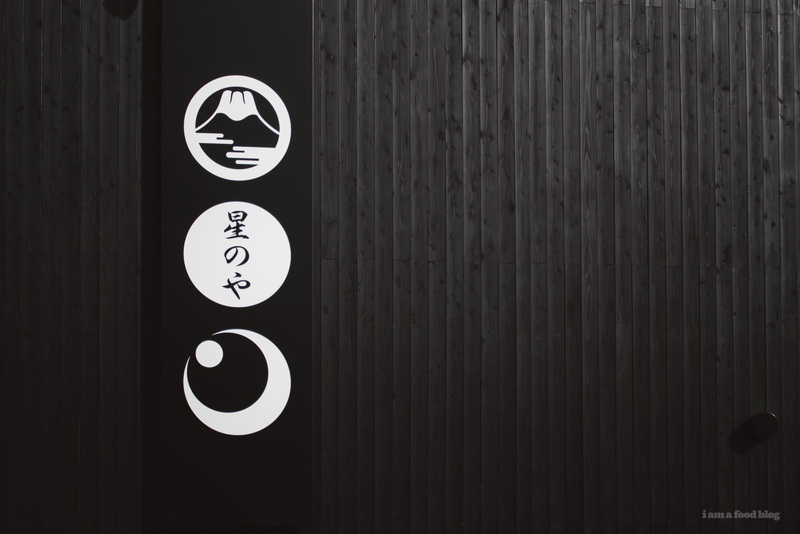 Curious – do you have any hotel recommendations in Tokyo? 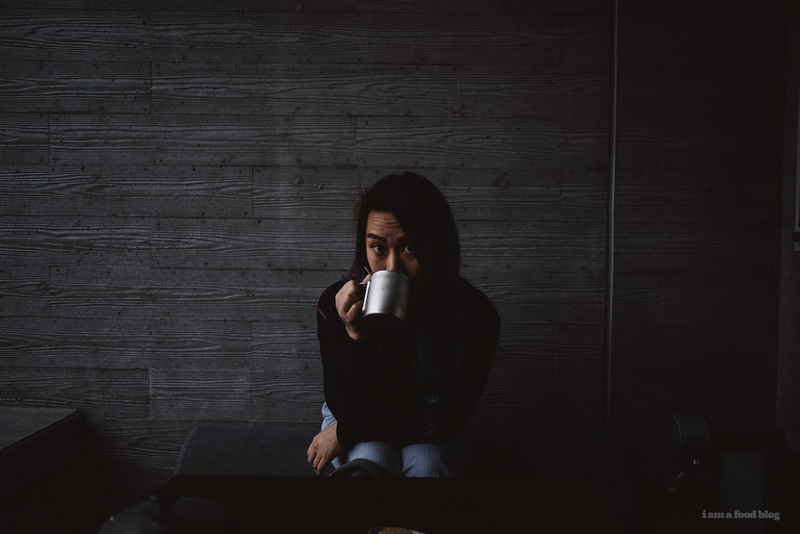 Hi Steph, love your blog and this post! 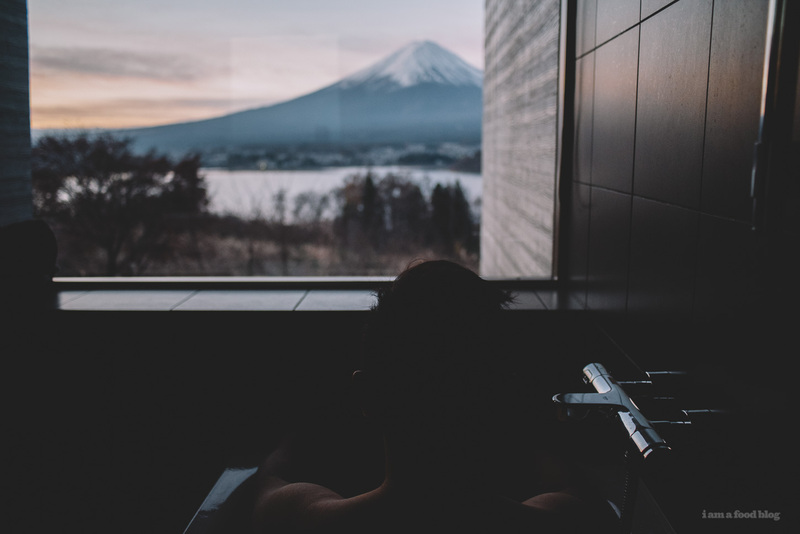 My boyfriend and I booked two nights at Hoshinoya Fuji in the middle of our trip to Japan because of this post — it looks so gorgeous! I’m wondering what bus you took from the train station to the hotel — I’ve been researching but the only way I’ve found to get from the train station to the hotel is the taxi they suggest. we ended up taking a taxi from the station to the hotel. it’s not so bad because they take you to the base of the hotel, which isn’t up the mountain, where all the rooms are, so it’s a bit closer! it was about 4000 yen or so, i think! hope that helps and have a great trip to japan! i’m so jealous! I just want to let you know that your pics/blog are amazing! Great job putting it all together. 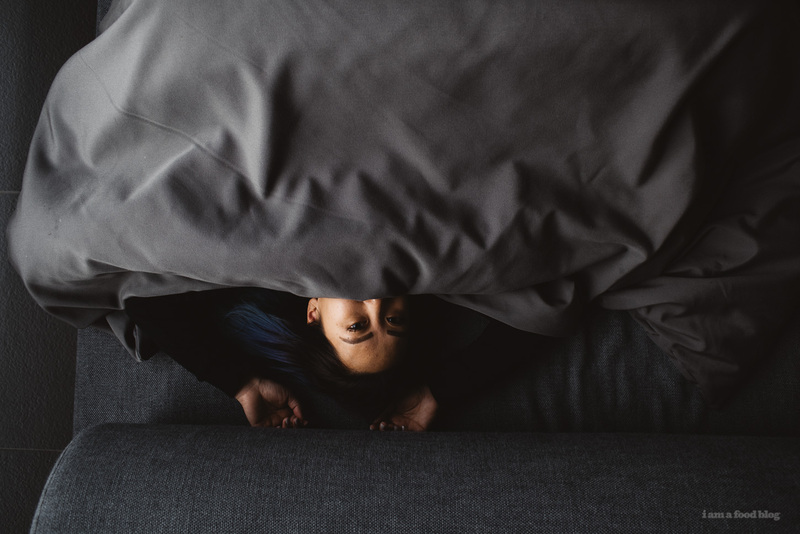 How many nights did you stay in Hoshinoya? 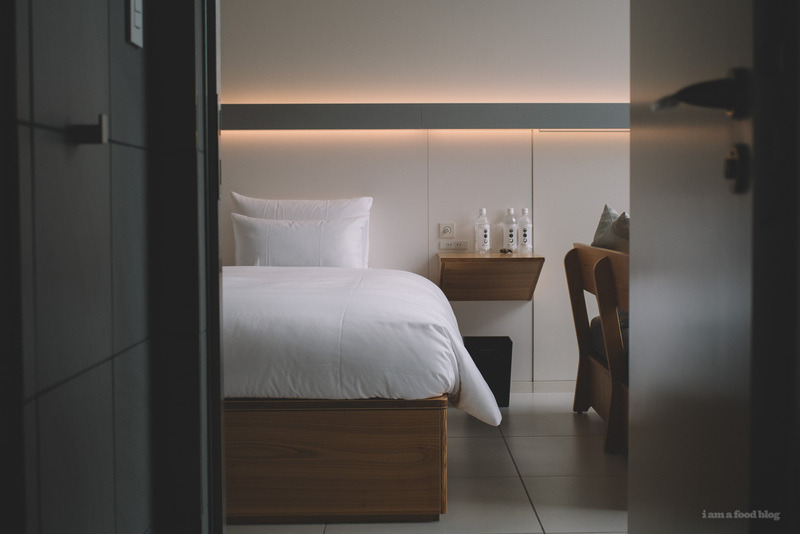 How many nights would you recommend? we stay for 3 nights, which i think was perfect. 2 would be a little short considering the time it takes to get out there!